I received this piece last week, having purchased it from Rick about a year and a half ago. 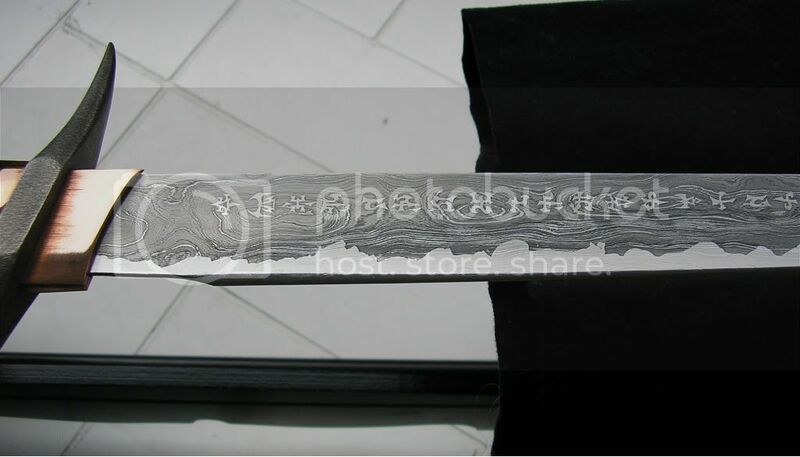 It was displayed on his page of available pieces, so it's not a custom commission; however I did ask Rick to make a scabbard for the blade, and thus incurred the delay. Now the glaive is finally in my hands, and having spent the last few days getting to know it, I felt it was time to share my impressions. Some images appear below as links due to their size. The design is obviously contemporary, and some may recognise its proportions as inspired by the Elvish pole arms seen in the Lord of the Rings films. However the glaive also borrows elements from Japanese nagamaki, as well as the European glaive (shortened variants of which are illustrated in the Maciejowski Bible), and the overall aesthetic of the piece is based on Rick's vision of a blade wielded by a race of serpent-riding warriors. It's a unique weapon that wouldn't feel at all out of place in a Robert E. Howard tale. The weapon's handling is very versatile. Easy to wield in one hand or two; the zircote shaft can be gripped near the guard or right at the pommel cap. With the shaft extended to maximum reach the spiked guard can be used as a hook or hammer, and while the smooth surface makes changing grip styles fluid, the waisted shape keeps the glaive secure in the hands. Regardless of grip style, the handling feels natural and intuitive. Balancing right at the guard, it's a light weapon that trades power for speed, and seems appropriate for various types of combat (including fighting on snake-back). The construction feels pleasantly solid, and Rick tells me that the tang extends about halfway down the shaft. The glaive's fittings are generally excellent. The guard is textured steel ground cleanly to shape, and it's fitted with a rigidity that inspires confidence in its offensive capabilities. The habaki is attractive, and displays a subtle scratch pattern. 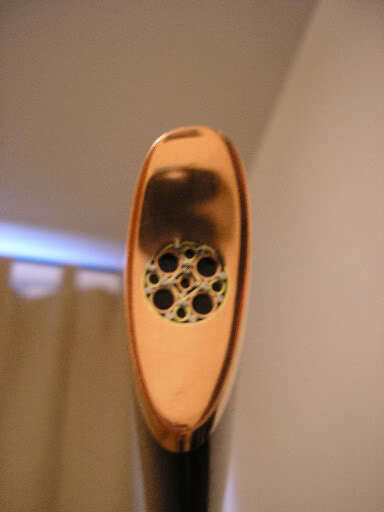 The copper works beautifully with the polished wood of the shaft, and suits the piece very well. However, as can be seen in the picture above, the collar at the shaft's gaurd-end does not sit quite flush with the its underside. The little step this creates slightly unsettles the aesthetic, but its construction is perfectly sound. One thing I do dislike is the mosaic pin on the shaft's cap, pictured below. It wasn't something I was aware of until I received the piece, and I feel it's design doesn't suit the mood of the weapon. I would have preferred something more simple on the decorative pin, and had expected the cap to be all copper. I'm hoping it will grow on me, and indeed it does seem a bit less unattractive every day. Rick has told me he would be able to change the cap, though it would require destroying the present one; and kindly offered to cover the shipping both ways if I decided to send it back to be tweaked. Rick did the scabbard in wenge, and it's rock solid. I think it suits the glaive well, though the opinions of friends and family are divided on the issue. I find the contrast between the scabbard's ruggedness and the finesse of the weapon quite satisfying, and I'd say it was worth the price I paid. 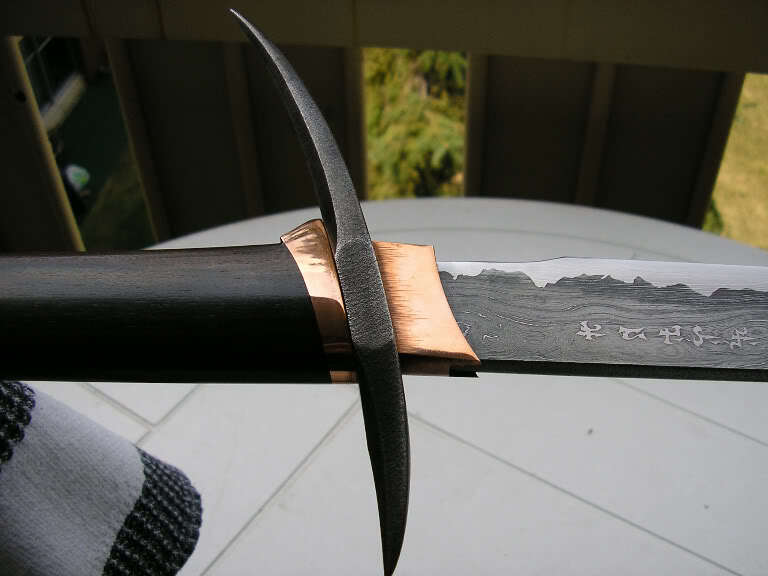 Though the fit is tight and there are no rattles once the blade is sheathed, the throat has no grip, so if the glaive is tilted even slightly past the horizontal, the scabbard starts to slide off. I asked Rick about this and he realised that he'd forgotten to add a couple of leather strips to the throat to grip the habaki. While he was happy to fix the problem, the task seems so simple that I asked him to send the pieces up here so that I can glue them in myself. I'm happy to say that the minor issues described above feel quite insignificant when admiring the glaive's blade. It is truly exquisite. Forge-folded and differentially hardened; it has been etched deeply over two-thirds of its surface whilst the edge remains brightly polished. 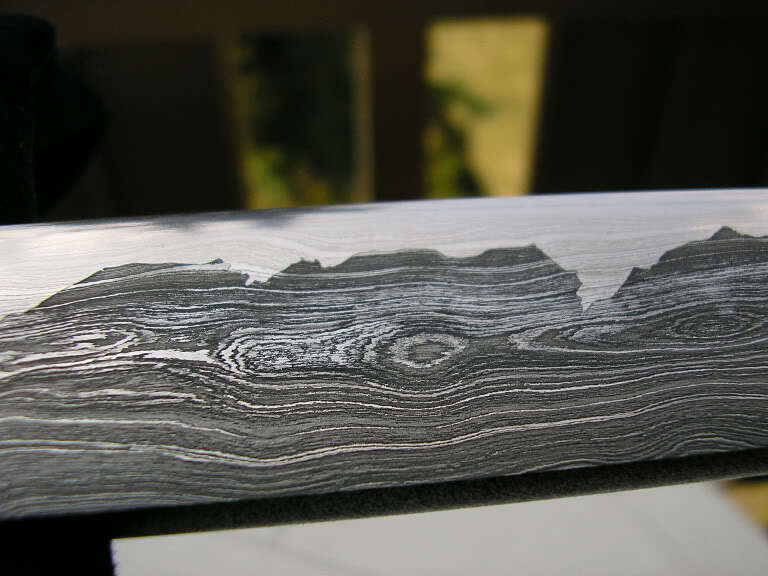 The contrast between the activities is beautiful; highlighted as they polarise when flowing across either side of the etched boundary. 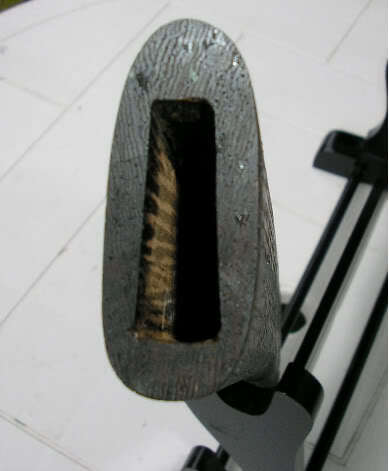 Additionally, the true hamon is visible as it runs down the blade behind the boundary, visible as a lighter area in the etch due to the different properties of the hardened steel. The activities are captivating, and I find great pleasure in pouring over their details under different light sources. The blade's lines are very clean, and though I have limited experience with Japanese sword terminology, I believe it to be a nice example of the hira-zukuri style; the stiff triangular cross section allowing for greater thrusting ability if the glaive is used in a spear-like manner. The final detail to comment upon are the mythic characters. Not only do they add a sense of otherworldliness to the piece, they are very well executed - the tiny designs are beautifully defined. Shaped with etch-resist to appear after the blade was darkened, Rick tells me they represent an incantation for victory on one side, and death to opponents on the other. Overall I'm very pleased with the piece. Minor issues and criticisms aside, the Abyssian Short Glaive is a weapon with a striking contemporary design enriched by elements of the fantastic that I find greatly appealing. I can honestly say that the balance between the unique experimentation of form displayed in the piece and the function of this type of bladed weapon has been deftly maintained. Very interesting review and fascinating weapon. With the balance at the guard one can have great speed and maybe favour draw cutting when used with a grip near the guard, but with both hand close together near the pommel some decent chopping ability might be seen ??? Aesthetics are also really impressive. Will have to re-read your post a few times to get every thing out of it. Thank you for this write-up. Would it be possible to show the weapon wielded in your hands so as to get a sense of size and proportion? Jean - thank you; and you're quite right about the handling. The weapon has a wonderful sense of 'pick up and play' about it; whatever martial background you approach it from. I've never trained in an art formally so take what I'm about to say with a grain of salt, but being familiar with the basic theory behind the use of most of the bladed weapons I've owned in the past, I was able to approach the glaive as a katana, longsword and pole arm; and found that certain stances and techniques from each style felt applicable. Lacking about two thirds of the shaft possessed by traditional pole arms, the weapon is best approached as a sword; but being so light it's very easy to perform far-reaching slashes and hammer strikes with an impressive degree of control, even when the shaft is gripped single-handed right at the end cap. Nathan - my camera is rather capricious, and providing shots that I didn't take after wrestling it into life for the initial session will be tricky. It shouldn't prove impossible though, and I'll certainly see what I can do.